From June 14-16, South Asian Americans Leading Together (SAALT) coordinated the fourth year of We Build Community (WBC), our signature capacity and skills-building program that brings together four diverse community-based organizations from across the country to participate in a year-long series of workshops, trainings, and ongoing technical assistance to support, deepen, and strengthen their work. As part of the WBC program, each organization is provided a sub-grant to support and build their civic engagement capacity that connects South Asian American communities with broader movements for racial, immigrant, and gender justice. 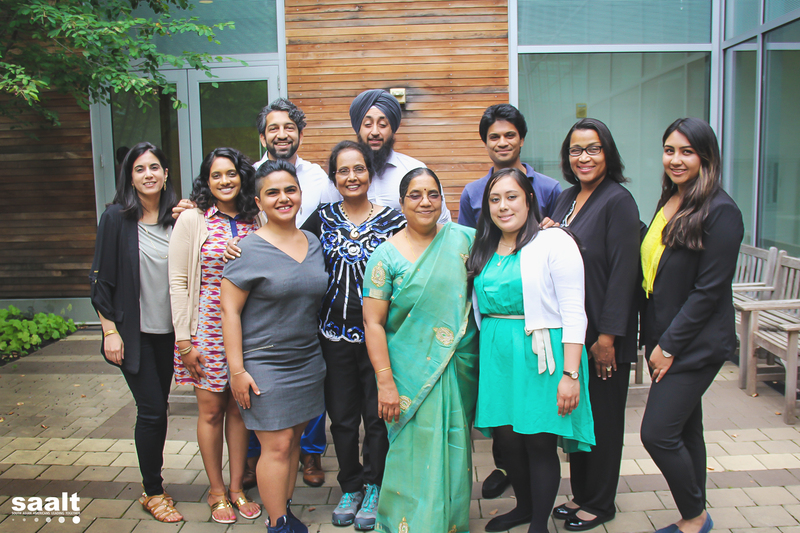 This year’s WBC cohort includes Asha Kiran, India Home, Jakara Movement, and Sapna NYC, four social change organizations and members of the National Coalition of South Asian Organizations who have developed innovative and thoughtful projects to mobilize our communities via effective civic engagement. Learn more about their respective WBC projects here. 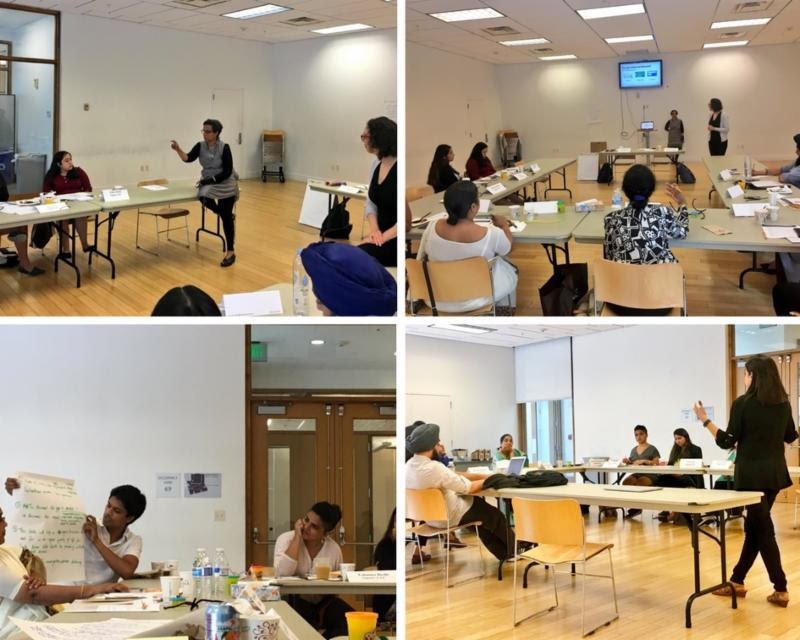 In June, WBC participants engaged in three days of workshops led by SAALT staff and trainers on immigrant justice, campaign building, community assessments, the power of data, fundraising, and communications. SAALT thanks the trainers who provided vital insights at the WBC convening, including Lindsay Schubiner (Center for New Community); Terri Johnson (Center for New Community); Radha Modi; and Kaajal Shah (K Shah Consulting). 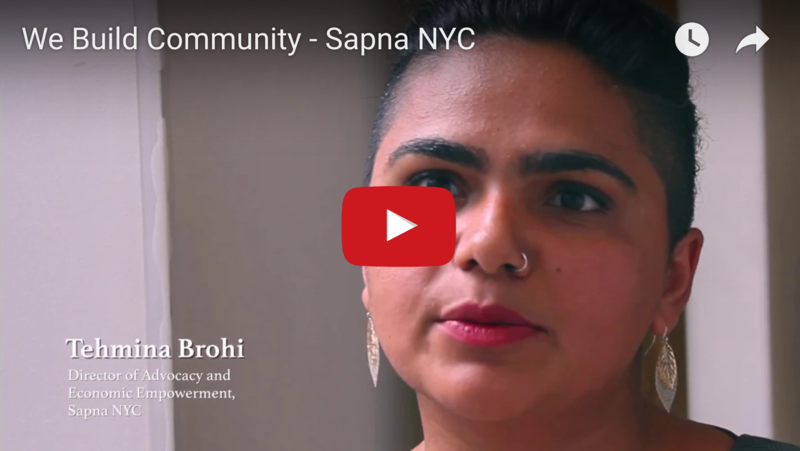 Tehmina Brohi discusses Sapna NYC’s mission and how We Build Community helps create a collective voice for change. SAALT would like to thank our supporters and donors who make the We Build Community program possible, and to our WBC cohort who continue to inspire and hold the line for our communities nationwide every day. Together, we are working towards the goal of a more just and inclusive society in the United States. Please consider making a generous donation to SAALT today. Your help will ensure We Build Community remains a key part of the long term goal of justice for all Americans. This entry was posted in alerts, SAALT Spot Blog, We Build Community by SAALT. Bookmark the permalink.